Ryan Creek is a tributary of the Humboldt Bay, a coastal lagoon on California's rugged North Coast. The creek's watershed provides habitat for stable populations of spawning Coho, cutthroat and steelhead, and several rare or endangered species including the northern spotted owl and red-legged frog. The Trust for Public Land is working with Green Diamond Resource Company to preserve 7,550 acres in the Ryan Creek watershed-an area at risk for development with its close proximity to the growing city of Eureka. The project's first phase will create a 1200-acre community forest for Humboldt County-a revenue-generating open space for county residents that also celebrates the county's working forest heritage with interpretive trails explaining forestry principles and forest ecology. The second and third phases of the project will place working forest conservation easements on the property's remaining 6,350 acres. 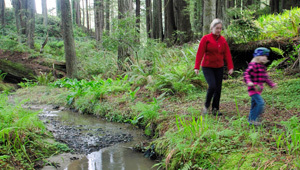 Plans call for construction of a recreational trail on the Ryan Creek property that would connect the shores of Humboldt Bay to the Headwaters Forest Preserve's old growth redwood groves.